The Motley Fool Canada » Dividend Stocks » 3 Big Movers on Friday: Is This the Start of a Huge Turnaround? 3 Big Movers on Friday: Is This the Start of a Huge Turnaround? Last Thursday was the last day to sell stocks in non-registered accounts for tax-selling purposes for the 2018 tax year. So, it may be worthwhile to explore losers that popped last Friday. AltaGas (TSX:ALA) stock climbed 7.7% to $13.26 per share on Friday, while the stocks of Baytex Energy (TSX:BTE)(NYSE:BTE) and Birchcliff Energy (TSX:BIR) appreciated 8.6% and 12.9%, respectively, to $2.27 and $2.98 per share, on the day. However, they’re all still trading significantly lower than where they were at a year ago, as shown in the chart below. Last Thursday was the last day to sell stocks in non-registered accounts for tax-selling purposes for the 2018 tax year. So, it may be worthwhile to explore losers that popped last Friday. AltaGas (TSX:ALA) stock climbed 7.7% to $13.26 per share on Friday, while the stocks of Baytex Energy (TSX:BTE)(NYSE:BTE) and Birchcliff Energy (TSX:BIR) appreciated 8.6% and 12.9%, respectively, to $2.27 and $2.98 per share, on the day. However, they’re all still trading significantly lower than where they were at a year ago, as shown in the chart below. ALA data by YCharts. The one-year price action of TSX:ALA, TSX:BTE, and TSX:BIR. AltaGas has been going through a transformation. The company gobbled up WGL Holdings, which had an enterprise value of $8.4 billion. It was a huge acquisition, seeing as combined utility currently has an enterprise value of about $15.9 billion. At the time, AltaGas management believed the acquisition will be accretive. However, fast forward to the present, the opposite is true. The company paid too much for the acquisition, and it took on a lot of debt to do so. In mid-December, AltaGas cut the dividend by 56% with the goal to free up capital for the longer-term growth of the company and to reduce debt. This helped the company to maintain an investment-grade S&P credit rating of BBB-. Currently, Thomson Reuters has a 12-month mean target of $19.60 on the stock, which implies there’s near-term upside potential of nearly 48%. The stock also offers a dividend that’s safer with a yield of 7.2% at the recent quotation. Energy stocks have done horribly in the past few years. Baytex stock is 94.6% lower than it was five years ago! However, that’s what makes it possible to double or even triple your investment now that the stock trades at about 1.6 times cash flow. Baytex trades at a cheap multiple partly because it is quite leveraged. At the end of the last quarter, it had $2 billion of long-term debt, while it generated about $412.5 million of operating cash flow in the past four reported quarters. After subtracting capital spending, it was only left with about $190.2 million of free cash flow. If its free cash flow generation remained stagnant, it’d take Baytex about 10.5 years to repay the long-term debt! No wonder the stock doesn’t pay a dividend! If the underlying oil prices improve, it’ll be a huge help to Baytex. Currently, Reuters has a 12-month mean target of $4.81 on the stock, which represents near-term upside potential of almost 112%. 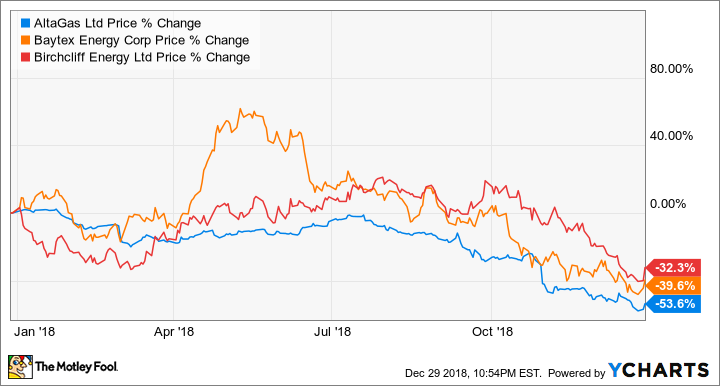 Natural gas stocks tend to do well in the winter. It might have worried some investors when Birchcliff stock fell about 26% from peak to trough in the past month. However, it finally looks like the stock may be turning around with the huge pop of as much as 13% on Friday. Despite the pop, the stock still trades at a significant discount to its normal levels. At $2.98 per share, it trades at about 2.5 times cash flow. Furthermore, its balance sheet is not debt-laden. At the end of the last reported quarter, Birchcliff had long-term debt of about $684.6 million, while it generated more than $321.2 million of operating cash flow in the past four reported quarters. After accounting for capital spending, it had more than $21 million of free cash flow remaining. Birchcliff offers a decent dividend yield of 3.36% as of the market close price on Friday. I don’t think the company will cut the dividend because it’s only about 9% of its operating cash flow. Reuters currently has a 12-month mean target of $6.06 on the stock, which implies there’s near-term upside potential of almost 103% on Birchcliff. If you have a high risk tolerance, you can aim to boost your total returns by considering a small percentage of your portfolio in stocks such as AltaGas, Baytex, and Birchcliff, which have strong upside potential. If high-risk investing is not your investment style, consider these top 2019 Foolish ideas instead. Fool contributor Kay Ng owns shares of ALTAGAS LTD., Baytex Energy, and BIRCHCLIFF ENERGY LTD. AltaGas is a recommendation of Stock Advisor Canada.